Let’s face it – not all corporate team building North East days are fun. You turn up, listen to a professional speaker, engage in some mediocre ice breaker and leadership activities, have a buffet and then go home without the supposedly ‘team building’ day making a difference. Well, it doesn’t always have to be like that. Many bosses and organisers are now turning to equine therapy to help strengthen their staff’s skills and focus on team building exercises that are relevant and can make a difference. You may be thinking how on earth can horses encourage team building North East?! Well, its very simple. Firstly, communication; you may have employees who have a not so practical approach when communicating their needs with others. Communication involves EVERYONE and is the most common cause of a project failure. They can often switch off and not listen, therefore not enabling in strong communication. Well, a horse can help with this. If a person moves to quickly or does not communicate effectively with a horse, then the horse will sense a stressful energy and quickly move back in order to defend themselves. In order to get the best success from the horse the employee must attempt a gentle and clearer approach, letting the horse determine good intentions. And this approach can then be applied to the office, developing insightful and reflective listening and the implementation of learning, improving self worth and self value. Ultimately leading to increased communication skills within the team. Secondly, horses help encourage honesty. Nobody wants to work in an environment where dishonesty is present. Horses are highly focused on the energy they sense from humans in which they can determine intentions. Those who are honest are far more likely to capture the attention of the horse. So leading a horse round whilst discussing your goals and aspirations could be a great time to discuss your career. Leadership – did you know it was not invented by humans? It is an ancient way that social animals communicate and coordinate together to improve their ability to survive, individually and in a group. Horses and humans share the same social, hierarchal instincts. By incorporating horses into leadership development, we learn that it is not about ‘command and control’, but our ability to relate. Horses teach leaders how to listen to what is not spoken, to trust their intuition, share their vision and to take necessary action for successful change. Lastly, the mirror effect. After a task is completed the whole group will come together to discuss what happened during the task, reflecting on what their actions were and how their horses responded. This part of the day is crucial, as it gives employees the words to be able to express their feelings and how they affected their horse. This will allow them to take responsibility for flaws, praise for successes and learning how to move forward (individually and as a team). 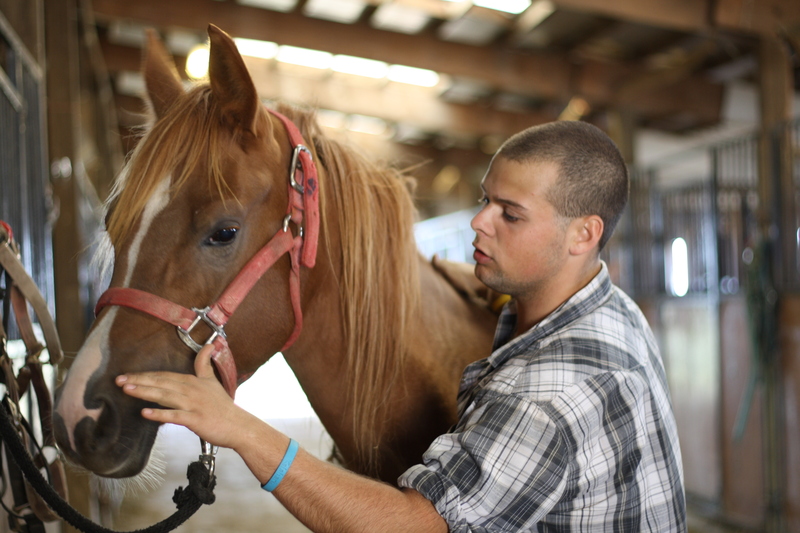 According to the Wall Street Journal even major companies such as Visa, Pfizer and Cisco have been using equine therapy for team building North East to promote strong communication skills, patience, leadership skills and effective leadership and management. It is amazing the effect horses can have on humans and teams. So if you want to get your staff involved in equine therapy visit our corporate team building North East days’ page or you can send us a message on Facebook to find out more information.